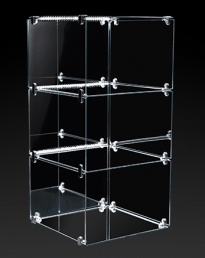 Glass display cubes, display cube light boxes, cube display bases and base storage units. 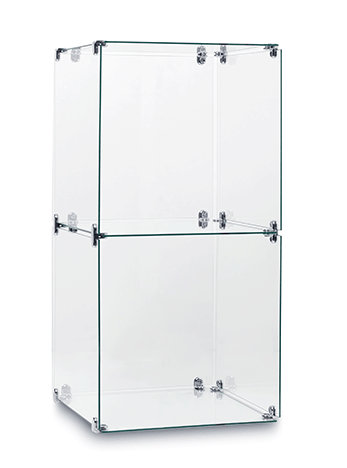 If you are looking to add a touch of class to your retail display, then glass display cubes could be the solution for you. 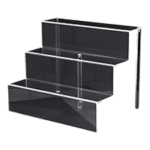 These multi purpose display containers are easy to use, great for drawing the attention of shoppers and can be used for a diverse assortment of merchandise as a great alternative to using standard shelving displays. 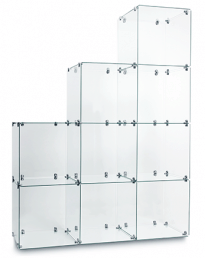 This glass display shelving is available in various different configurations of cube cabinets, from single cubes to 12-cube stacks. 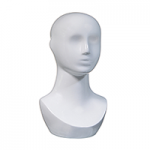 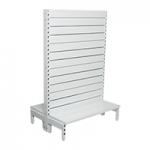 They can also be customised with a number of easy to use accessories that can make them suitable for any retail environment. 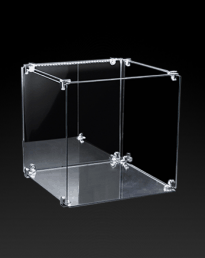 What are glass display cubes? 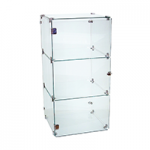 Glass display cubes are cube-shaped glass box display cases display cases made out of toughened safety glass. 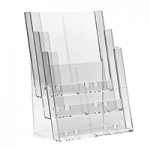 They differ from many other types of glass-based retail display in that they are frameless – made entirely out of glass apart from the steel connectors which join the sheets of safety glass. 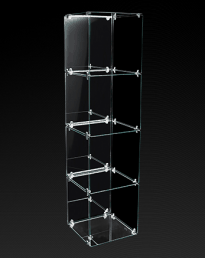 The glass cube display cabinets are designed out of individual cubes. 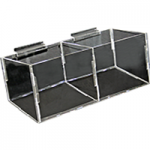 They are available in various different sizes, with larger models consisting of multiple cubes stacked on top of each other or side by side. 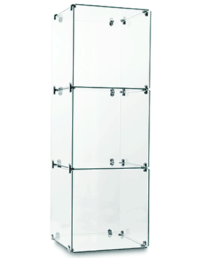 Cube display units are great for showcasing products such as jewellery, trophies, antiques or rare collectible goods. 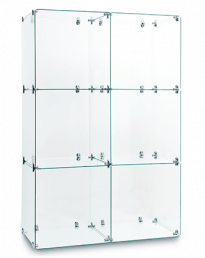 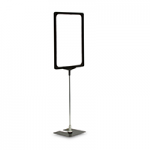 These glass display units can be placed anywhere in the store, whether that be up against walls, free standing in store aisles or in front window displays. 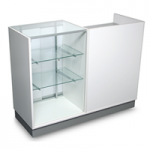 Smaller models are suitable for counter top display. 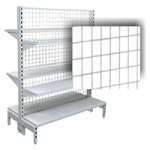 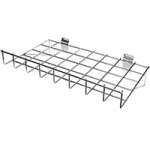 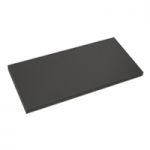 Glass shelves – additional 400mm x400mm glass shelves made from 4mm thick toughened safety glass. 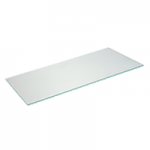 Mirror panels – 5mm thick mirror glass panels that can be used as base or back panels to add light and effect. 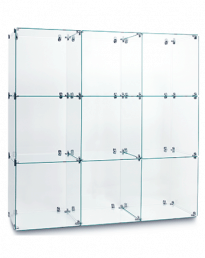 Not safety glass. 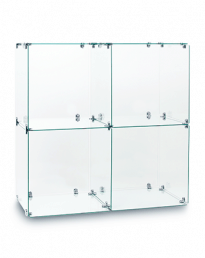 Where can glass display cubes be used? 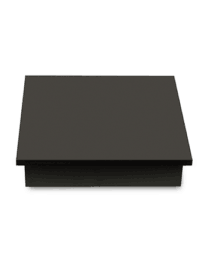 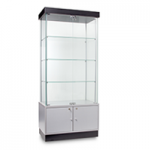 Jewellery stores – great for keeping valuable jewellery pieces well organised and attractively displayed. 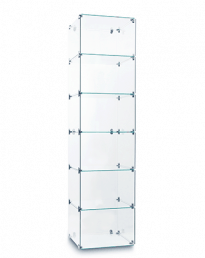 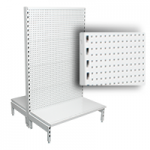 Jewellers can choose from the range of towers and mega-cube configurations to suit their requirements. 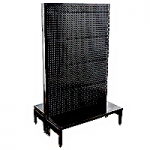 Antiques stores – collectable and valuable items such as ornaments, knick-knacks and rare books can be kept in pristine condition. 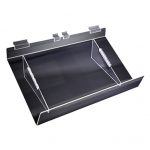 Electronics stores – valuable and easily shop-soiled goods such as laptops, new model mobile phones and expensive tech gadgets look good in these cases and are protected from customer handling. Bakery stores – artisan cakes and other baked and crafted delicacies look great as part of either a counter top or tower cube window display. 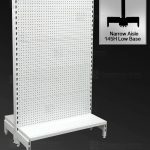 Arts and crafts stores – the multi and mega cube tower displays look great in an artistic environment and give creative store owners the chance to show off their individualism with unique merchandise displays. 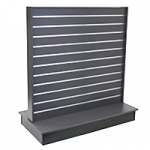 Gift stores – expensive and attractive gifts such as figurines or designer stationery sets can be brought to life in a display with LED lighting. 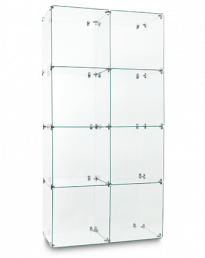 Designer boutiques – can use glass display cases for exclusive accessories such as designer scarves and gloves laid out as part of a cube tower display in the window or on the shop floor. 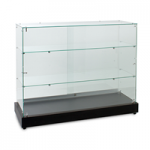 Trophy stores – the larger glass cases offer the perfect display solution for these stores to safely and effectively showcase anything from silver cups to medals to commemorative plaques. 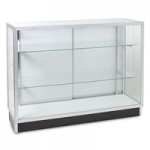 They are stylish – glass display cases add a touch of class to the store and are an effective showpiece that can be used to draw shoppers into the store and towards certain products. 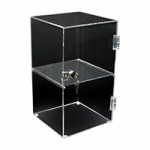 Goods can be attractively displayed on stands inside the cubes, and accessories such as LED lighting and mirrored glass can be used to good effect to create stylish arrangements. 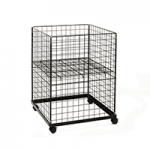 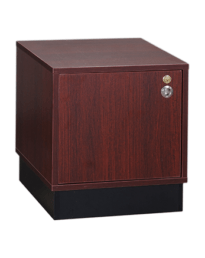 They are very easy to use – from being easy to assemble to causing minimal fuss in maintenance on a day-to-day basis, these cubes are designed to make life easier as well as help shift units. 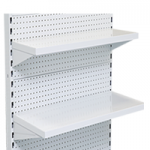 Shelves fit easily in and out with adjustable clips and everything is easily wiped clean with a damp cloth. 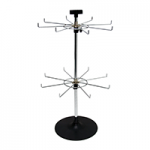 They are flexible – from small counter top models to the 12 cube mega towers, there is something to suit every retailer from elite boutiques to dusty old antique stores, from multi-floor department chain stores to tiny family-run independent businesses. 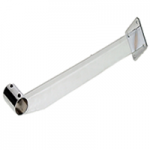 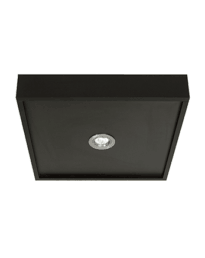 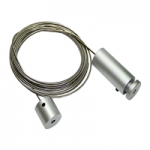 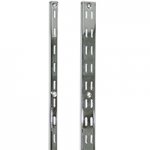 They are durable – all products are made using toughened safety glass and high quality chrome steel connectors. 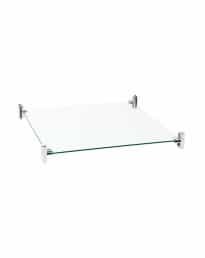 The glass is scratch and stain proof and, unlike materials such as metal or wood, won’t start to deteriorate in quality as time goes on. 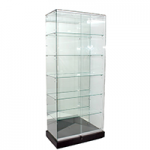 All cases should last very many years if looked after properly. 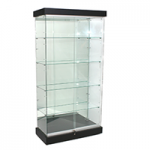 They offer protective display – all products displayed in the glass cases can be viewed but not touched. 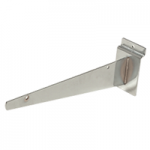 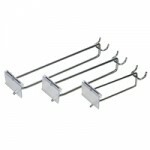 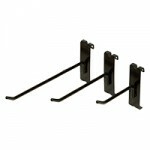 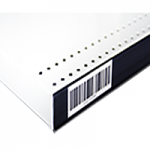 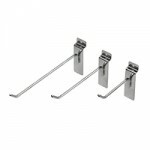 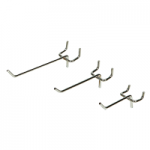 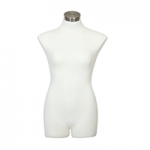 This helps to protect stock against damage, shop soiling or theft, which is a good money-saving benefit to businesses. 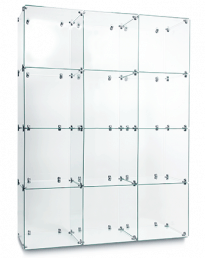 They save on space – glass display cubes are very efficiently designed so as to include no waste. 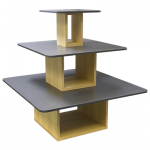 There is no cumbersome or chunky wooden frame or elaborate design feature that serves no purpose. 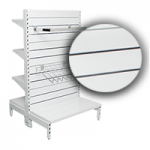 Every millimetre inside the case can be used as display space, so these units are a very effective use of space on the shop floor. 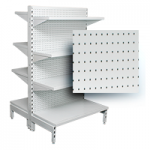 Ultimately, more products can be displayed and there is more room for browsers in the store. 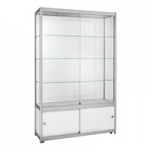 If you are a retail store interested in purchasing glass display cubes or any other shop fitting or commercial shelving product, get in touch with Shopfittings Direct on 02 9608 5122 or email sales@shopfittingsdirect.com.au. 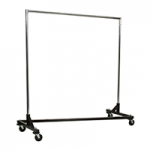 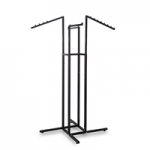 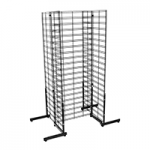 We can supply and ship anything from clothing racks to glass display cubes to Australia-wide businesses, including stores in Sydney, Melbourne, Brisbane and Adelaide. 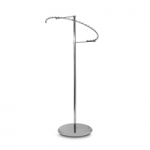 You can visit our showroom in Sydney, order stock online or contact our expert staff who will be glad to answer your questions and help advise you on your purchase. 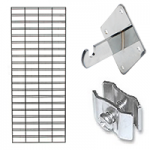 We offer competitive prices as well as discounts on bulk orders.